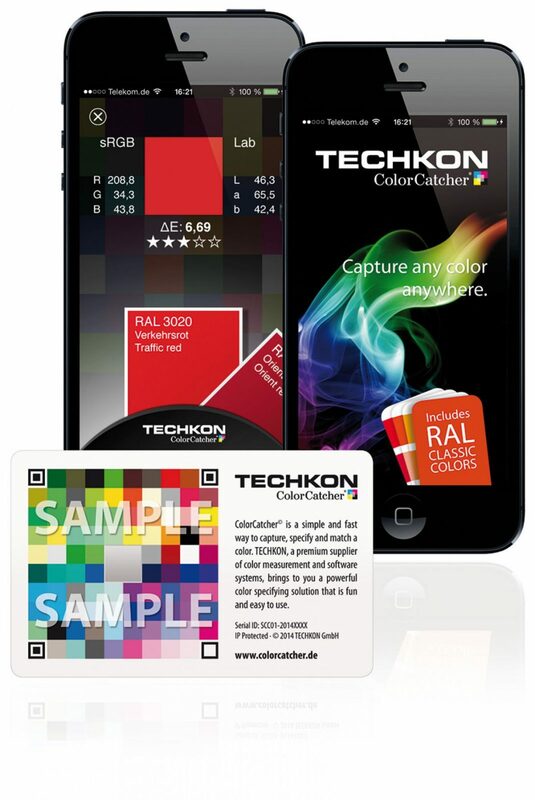 TECHKON ColorCatcher is a simple and fast way to capture, specify and match a color with a smartphone. 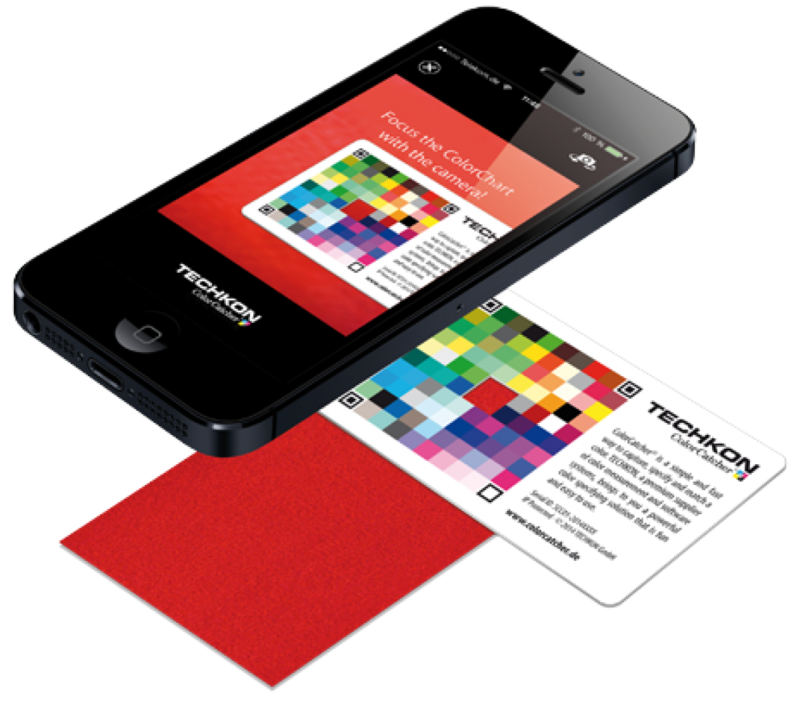 TECHKON, as a premium supplier of color measurement systems and software solutions, offers a powerful color specifying solution that is fun and easy-to-use. Download the ColorCatcher App on your smartphone. Place the ColorChart card on the color sample you want to capture. Launch the ColorCatcher App. Make sure that the complete color target including the color you would like to capture is displayed in the viewfinder. The smartphone camera will detect the ColorChart automatically. The precise Lab- and sRGB color values and the matching color of the RAL Classic Colorbook will be displayed. Digital cameras, in particular those integrated into smartphones, are usually not color-confident. This means captured colors will be different depending on the lighting conditions, the distance to the captured object and the camera‘s settings. 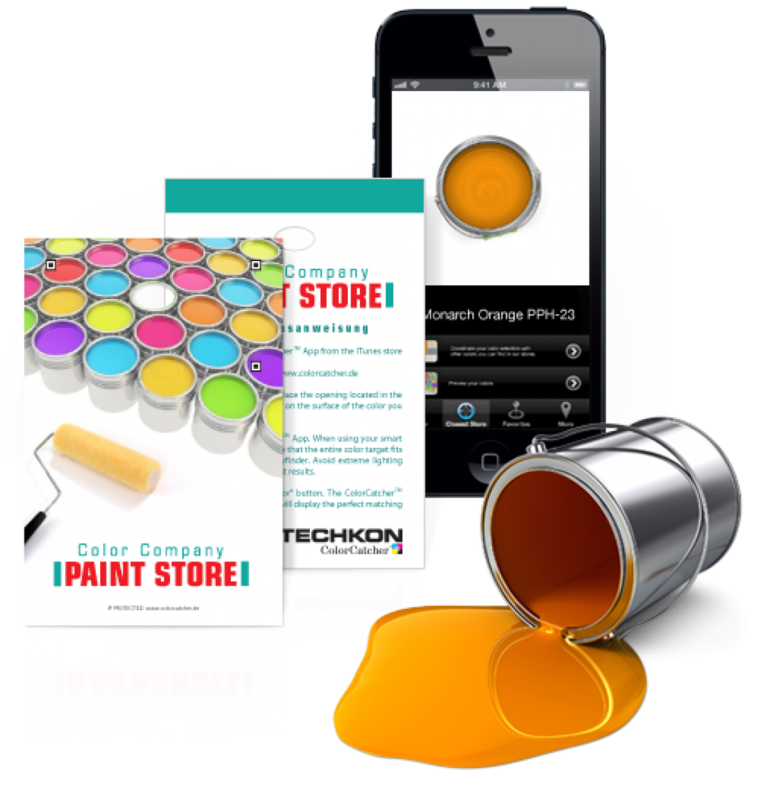 Now, with TECHKON’s IP-protected ColorCatcher technology, it is possible to generate color-confident color data on mobile devices. The Color Transformation Engine embedded in the ColorCatcher App, in combination with the ColorChart, which contains absolute color data, delivers accurate color information. ColorCatcher can be used anywhere exact color information is required and the use of a spectrophotometer would be too complicated.The following examples give an indication of the wide opportunities for ColorCatcher. According to your request, we can offer the core module for accurate color capturing to be integrated into existing apps or we can develop an entire customer specific application. This can include the design and implementation of the graphic user interface and the integration to databases. We offer this technology for the current mobile device platforms such as Apple iOS, Android and Windows. We can customize the size and layout of the ColorChart as well so it can be embedded into a company‘s corporate identity on any kind of printed product. Additionally we offer marketing services for developing business models around the ColorCatcher technology. You know the situation, how unsatisfying it can be to specify the right color. Printed color swatches have their limitations. They have color variations due to the print process and aging of the inks and paper used. The use of color books or color swatches can also lead to inaccurate color matches, because of the small color sample size and the variations by ambient lighting conditions and different observer’s perception. Paint manufacturers can use the ColorCatcher technology to integrate it in their existing point-of-sales systems or build new business models around it. Designers can use the App to communicate absolute color information.